All transactions are safe and secure with a reliable history in online purchasing behind each of our associates. 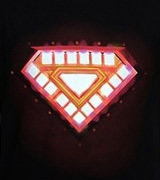 Buy the Extremis Core Iron Man t-shirt to own Iron Man clothing and merchandise. Here's your chance to own a one of a kind Iron Man shirt that features the Extremis chest core that is seen in The Avengers movie. These costume tees are based on the armor from the six-issue Extremis comic book story arc. The front displays an image of Tony Stark's chest reactor. Prepare for the next Iron Man movie experience and get your hands on one of the most sought after Tony Stark Iron Man movie items. Also, get classic Iron Man action figures and toys. In addition to the Extremis Core Iron Man tee above, browse the Iron Man Clothing Gallery for more apparel like men's and women's clothes, kids shirts or hoodies.